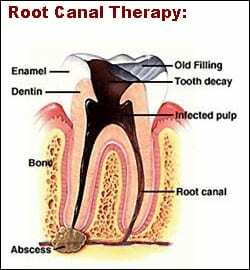 If you have a tooth infection, you need a root canal treatment, also called endodontics. Some people think they can just take an antibiotic and avoid the root canal, but that won’t work. The reason is antibiotics can’t reach the infected tissue inside the tooth. That needs to be removed or the infection will continue to spread. Once removed, the space that it occupied is filled with a sealer to keep bacteria out of the tooth. The pulp is the soft tissue inside the tooth that contains the tooth’s nerves and blood vessels. If the pulp gets injured or if decay gets into the pulp, it can’t repair itself and will die. Once it has died, bacteria cause an infection inside the tooth. If this infection goes untreated, it will build up pressure and form an abscess. An abscess can damage and destroy the bone around it and can lead to the tooth being lost. Some people, out of fear because of what they have heard about root canal treatments, elect instead to have a tooth extracted. This is a big mistake. First, an extraction is the most traumatic dental appointment there is. Plus it is almost always better to save a tooth. Modern techniques for root canal treatments make them pretty easy on the patient. In some cases, the tissue inside the tooth is dead and you wouldn’t feel it even without Novocain. But we still use Novocain, just to make sure you are numb. When a tooth has a root canal treatment, it usually means that a portion of the tooth is missing, weakened, and at risk of fracture. We will usually recommend that a tooth like this have a dental crown placed, because a fracture could make the tooth unrestorable and you will end up losing it. You can learn more about crowns on our porcelain crowns page. The crown is a separate procedure with a separate fee. If you are in need of a root canal you may call our office to schedule an appointment, or if you prefer, you may click here to request an appointment online.